Has Congress Overreached in Search of Comfy Air Travel? 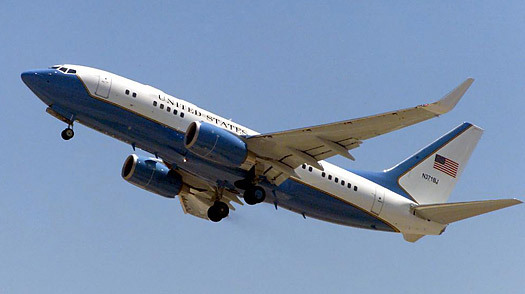 Last year’s howls of outrage when U.S. auto executives flew to Washington on private jets to seek government bailouts may soon be repeated, now that the House of Representatives has added $330 million to the 2010 defense budget to buy four new planes for the Air Force’s VIP fleet. That’s because the planes that usually fly generals and White House officials around the globe are also being used  on 15% of their flights  to ferry lawmakers around in the kind of comfort that most Americans who endure long security lines and cramped economy cabins can only dream about. House members who favor acquiring the new planes argue that they’re needed replacements for aging aircraft, and will be less costly to fly. The current Gulfstream C-20 costs $6,100 an hour to operate, compared with $2,700 for the more modern Gulfstream C-37. The Air Force VIP fleet is usually reserved for work-related foreign travel, which is a double-edged sword for lawmakers. While some boast they avoid it to save taxpayers money, others argue it is needed to visit foreign leaders and conflict zones to get a firsthand look at the impact of U.S. foreign policy. Mounting demand for congressional travel may help explain why the House has ordered the Pentagon to buy two more $65 million G-5s  Gulfstream V jets, known in the Air Force as C-37s  as part of the $636 billion defense budget, along with an additional pair of $70 million C-40s, the military version of the Boeing 737. “We’ve always frowned upon earmarks and additives that are above and beyond what we ask for,” Pentagon spokesman Geoff Morrell said when asked about the additional planes last week. The standoff between the House and Senate won’t be resolved until lawmakers return from their August recess to iron out the conflicts in their defense bills. The House also instructed the Air Force that two of the new planes be stationed at Andrews Air Force Base, just outside the capital. Andrews, of course, is home to Air Force One and the élite fleet of 16 additional executive jets flown by the Air Force’s 89th Airlift Wing . Hard data on the 89th is tough to dig out and, obviously, both the military and Congress like it that way. The go-to source for public reports on government spending  the Government Accountability Office  answers to Congress. “We haven’t looked into it in a long time,” a GAO spokeswoman says. But the Air Force, after a day of asking, reports that the 89th currently has two Air Force Ones, based on the Boeing 747 airframe; five C-20s ; four C-32s ; five C-37s and two C-40s . See the top 10 outrageous earmarks of 2008.